Now that most of my (former )painting service back-log has been finished and posted out to customers I've been able to squeeze in an hour or two of painting my own miniatures. My old Imperial Guard army has been languishing since 5th edition and is due a revamp. Thing is, I'm completely uninspired by my old collection of guard infantry and feel the need for a complete re-start. At least where the human infantry elements are concerned. Most of my existing collection is going to be consigned to continuing oblivion while I resurrect one of my first 40K armies from back in 1988: the 8th Necromundan regiment. 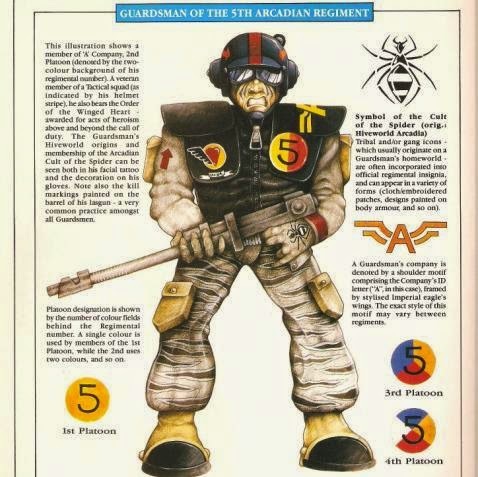 The very same regiment that graced the front of the first ever plastic IG box 27 years ago. I'm not going to go with the classic paint scheme entirely however. I've long since gone off the tiger stripe camo and metal helmets. However, Ill still be using a predominantly grey and black colour scheme, but with black helmets and webbing. I think one of the reasons I've "gone off" my current Guard army is their look. Although heavily converted with third party heads and the like, I've never liked the basic look of the Cadian models they're based on. I far preferred the look of the old Cadian metals. Fortunately, Victoria miniatures has come to the rescue with their "Arcadian" range. 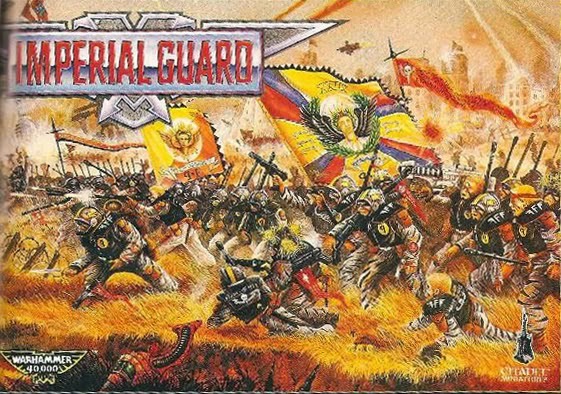 While clearly inspired by the old metal Cadians, there are clear influences from the 1988 box set as well, including the look of the lasguns (by the way I love that the name "Arcadian" harkens back to the old days of 40K lore as well). The "Arcadian" miniatures themselves are lovely sculpts, and I've already ordered a couple of veteran squads and a CCS from the company. Combined with a few of my older GW miniatures and my soon to be repainted collection of vehicles, they'll hopefully make a fine start to my newest 40K army. The female Arcadian miniatures are even nicer. I've ordered 15 males and 10 females. I don't plan on keeping up that ratio for the entire army, but I do plan on sprinkling the females around a few different squads when I expand my collection a bit. The mini's aren't inexpensive but I don't mind paying for quality. However, the price will keep the numbers of infantry models in the force fairly low. So I'll be going full mech with this one. Hey Brian - long time no hear mate. Hope all is well. Frostgrave, "Genie in the Bottle"
The Propaganda Architect: The Warlord's Boy Band. FFG's STAR WARS X-WING...I'm Giving In To The Dark Side! Obviously, I am not affiliated with or employed BioWare, Games Workshop or Lucasfilm in any way. This is not an official Bio War, GW or Lucasfilm blog. Mass Effect, Mass Effect 2, the Mass Effect logo and all associated images and game content (including the banner image above) are trademarked or copyrighted material registered to Bioware and/or EA Games. No challenge to the ownership of said material is intended or implied. Completely original content only should be treated as creative commons. All images of painted miniatures or original artwork may likewise be considered material classified as creative commons unless clearly attributed to the original artist or alternatively attributed to an unknown artist. 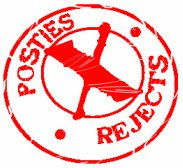 Artwork or images clearly attributed to a given artist remain the sole property of the artist in question and, where possible, have been used with permission.